This blog post appears as a bit of nostalgia for those who remember Gregg Wallace from the mid-1980's. 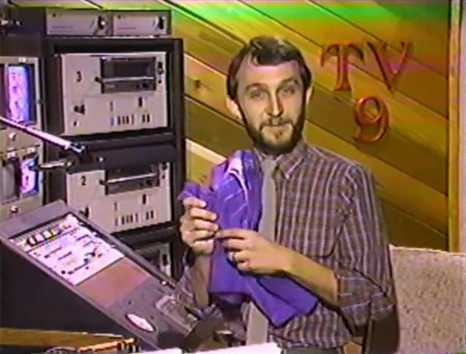 Below are four screenshots from the YouTube video showing some of the DJs who worked however briefly at Flagstaff early 1980's TV9. The fledgling TV station was way ahead of its time and didn't last long. It's now an obscure footnote in Flagstaff's media history file. The Wallace Family (Gregg, Maggie and Kelli) arrived in Flagstaff in either late 1983. Gregg had an impressive TV background at the time and hooked on with TV9 just before it went belly up. 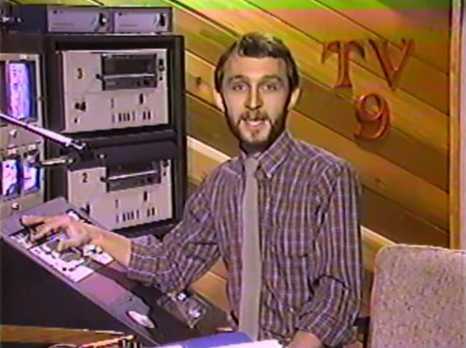 He's shown here cuing some early genre music videos as TV9's Music Director. 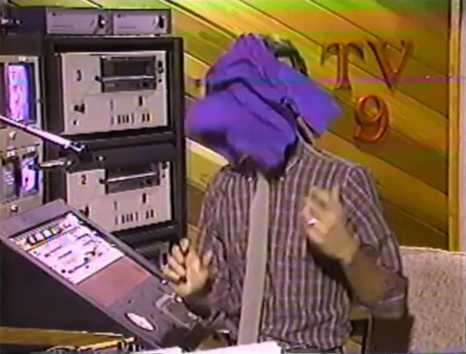 During this vignette he puts in a plug for TV9 t-shirts and suddenly one of the t-shirts flies in from off-stage hitting Gregg smack in the face. He recovers nicely and continues shilling shirts. After the shirt promo, he then goes back to being a TV DJ. You can click here to watch the full 8:12 video. Gregg is the second DJ in the video. He comes on at 1:43 and fades to black at 2:50. It's an endearing Flagstaff Flashback for those who know Gregg and remember the good ol' days of a sleepy little mountain town perched alongside Route 66 and the Santa Fe railroad. These screen shots and the video are used here with permission from Gregg Wallace. Wow! I love it! So much fun to see something I never even knew existed. 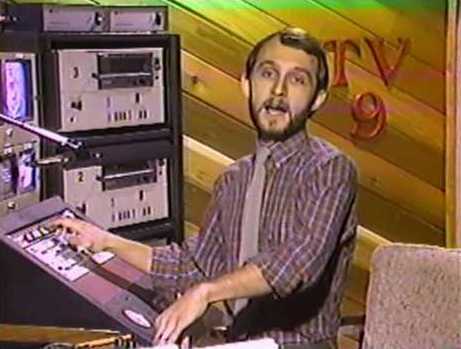 I have seen some pictures of the tv/radio days, but the video is great. Thanks for sharing John!